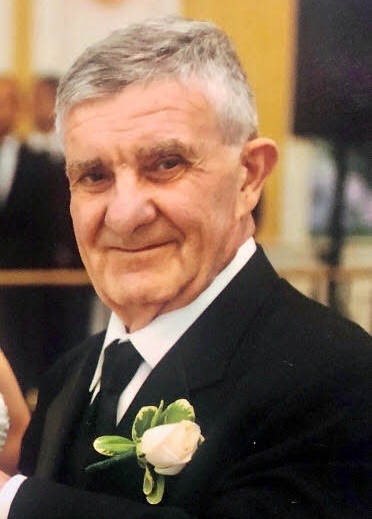 Vito LoPresti, 81, of Jersey City, passed away peacefully at home surrounded by his loving family on February 5, 2019. Vito was born in Scala di Patti, Messina, Sicily, and immigrated to Jersey City in 1967. Vito was irrepressibly happy his entire life, sporting an impish smile and a generous laugh. He was a lifelong masonry worker with Local 3, who retired in 2004, just in time to enjoy the arrival of his two grandchildren, whom he treasured. Vito enjoyed nothing more than spending time with his family. He loved returning to Sicily nearly every summer to visit relatives there, while always making sure to be back in late August to can dozens of bushels of Jersey plum tomatoes. Vito was the beloved husband of 51 years to Lucia Rampulla LoPresti; devoted father of Antonia LoPresti Giglio and her husband Anthony Giglio, and Maria LoPresti Rufino and her husband Ralph Rufino, Jr.; cherished grandfather of Sofia and Marco Giglio; loving brother of Giuseppe LoPresti (deceased) and Rosaria Orlando (deceased); Gaetano LoPresti and Maria Pristera (deceased); Antonino LoPresti (deceased) and Rosaria Mastrolembo; Maria LoPresti Maimone (deceased) and Santo Maimone; and Michael LoPresti and Nunziata Ravipinto. Vito is also survived by many loving nieces, nephews and cousins. Family visitation and wake will be on Friday, February 8, 2019 from 4:00pm to 8:00pm at RIOTTO FUNERAL HOME, 3205 John F. Kennedy Blvd., Jersey City, NJ 07306. Funeral will begin on Saturday, February 9, 2019, 8:30am at the funeral home. Funeral Mass will follow 9:30am at St. Nicholas R.C. Church, 226 Central Avenue, Jersey City. Funeral procession will commence at 10:30am to Holy Cross Chapel Mausoleum, North Arlington. In lieu of flowers, memorial contributions may be made to The Alzheimer’s Drug Discovery Foundation (www.alzdiscovery.org/donate).